1. Sync your orders and generate 100s of labels in a few clicks. Once the label is generated, Automatically Update the order status as “completed” and send the tracking number back to WooCommerce. 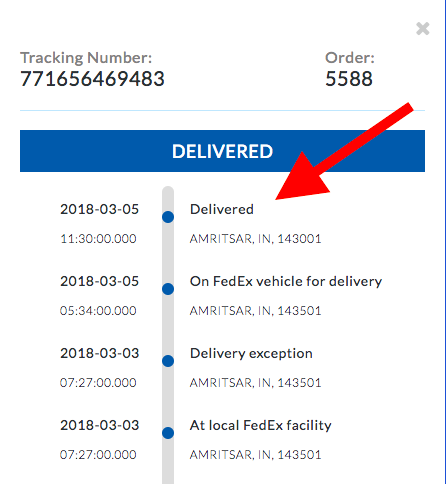 This makes it easy for your customers to track their shipments with minimal effort from your side as the tracking id is also attached to the order completion email. 2. Provide Live tracking notification to your customers. Without a doubt, always be sure where your shipments are located and prevent cases of nervous phone calls and emails from customers asking for tracking information. 3. Automatically Choose the cheapest Shipping rate among all shipping carriers. If you are using more than one Shipping carrier and have defined Automation rules for the same, Storepep will simply select the cheapest of the two and proceed with it. This literally saves shipping costs for you! – Leaders in WooCommerce Shipping. We have a hugely experienced team with a reputation of already being the best in WooCommerce Shipping(XAdapter.com). Having catered to over 50,000 customers across 50+ countries, be rest assured that you are in safe hands. You can contact us with any queries that you have. – You will be personally on-boarded into our system by our Product Manager. You will be assigned a Product manager who will onboard you into the system and will personally help you with the integration. This is because, as part of pre-sale and post-sale support, we are very concerned and willing to jump into great lengths to help our customers. So what’s holding you up? Just click the button below and let us redefine your shipping landscape for the coming years ahead.